The term "sleepers" is overused in fantsy football leagues, but the concept still has merit. Leagues are often won by finding and successfully predicting players who are undervalued in drafts. These bargains don't have to be obscure names or unheard-of players necessarily. Plenty of household names, as you'll see below, should qualify as sleepers based on the fact the market is undervaluing their performances. These are 15 players who, in our opinion, have some of the best chances of outperforming their preseason draft positions. Big names, small names, sleepers or stars, these guys have value potential. 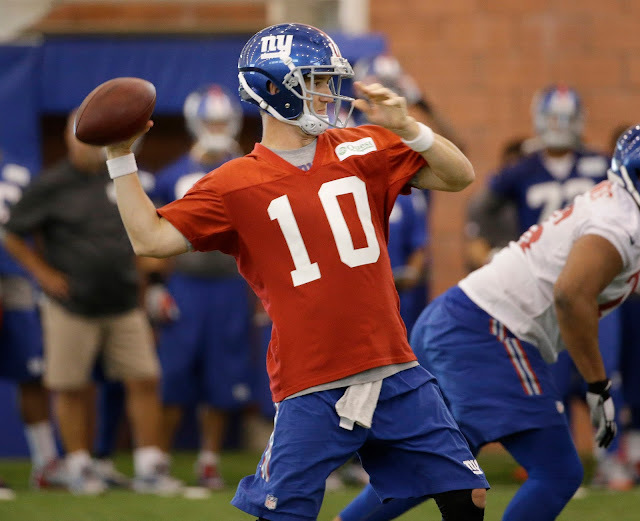 Eli Manning, QB, New York Giants: Manning quietly had one of the best seasons of his pro career in 2014, when he threw for 4,410 yards with 30 touchdowns and 14 interceptions. Coming off a disastrous 2013 campaign, Manning benefited from the Giants' new West Coast offense and the eventual emergence of dynamic wide receiver Odell Beckham Jr. Manning is not without warts, namely in his turnovers and tendency to lay massive eggs in fantasy, but he has improved weapons and comes at a steep discount in the mid-to-late rounds. Manning has high-upside QB2 and fringe-QB1 potential and should often merit streaming consideration. Teddy Bridgewater, QB, Minnesota Vikings: Bridgewater did more than hold his own under trying circumstances as a rookie, with the suspension of running back Adrian Peterson all but rendering the Vikings into a one-dimensional attack. Bridgewater kept the ship steady after winning the starting job and closed the season strong, averaging 240 yards with 10 total touchdowns to six interceptions in his final six games. Peterson is back in 2015, and Minnesota suddenly has a cupboard full of playmakers in Charles Johnson, Mike Wallace, Kyle Rudolph and Cordarrelle Patterson. Bridgewater is poised to take the next step. Justin Forsett, RB, Baltimore Ravens: Forsett has his share of skeptics as a soon-to-be 30-year-old who came out of nowhere as a fantasy star last season. Always an adept receiver out of the backfield, Forsett thrived in a featured role in Gary Kubiak's offense with 1,266 rushing yards, 44 catches for 263 yards and eight total touchdowns. Kubiak is off to Denver and being replaced by Marc Trestman, who oversaw a 102-catch season for Matt Forte in the Chicago Bears' offense last season. Forsett, who has averaged 5.1 yards per carry in his career, could be an even bigger PPR star with a shot at 1,500 total yards from scrimmage. Doug Martin, RB, Tampa Bay Buccaneers: Martin looked like a man possessed in the preseason as he seeks to put two years of struggles behind him. Oh, and he enters a contract year fighting for his future earnings potential. Healthy again after missing 15 games over the last two seasons with leg and shoulder injuries, Martin is running like a "wild man," his offensive coordinator told the Tampa Bay Times last week. He certainly looks as healthy and explosive as ever, showing the same form that fueled a dynamic 2012 season, in which Martin totaled 1,926 yards from scrimmage and 12 touchdowns. Even an outside shot at that production is worth exploring in the top 70 picks of fantasy drafts. Ameer Abdullah, RB, Detroit Lions: Abdullah is losing his sleeper status by the day, but the fact remains: he's turning heads with his shifty running style and is in outstanding position to get work in the Lions' backfield. Veteran Joique Bell is still on the mend after offseason procedures on his knee and Achilles, and Theo Riddick hasn't shown he's anything more than a third-down and change-of-pace back. Abdullah lacks an ideal build to carry a full workload, but he has the look of a special talent. If Bell is slow to re-enter the lineup, Abdullah gets an early audition to jump to the top of the Lions' committee. Who knows if Bell can even unseat him for starting duties in that scenario. Jeremy Maclin, Kansas City Chiefs: Contrary to the prevailing concern, Maclin's departure from Philadelphia to Kansas City isn't an automatic downgrade to his fantasy value. Yes, the Chiefs are shorter on talent and have certain offensive limitations — ahem, Alex Smith — but they're also showing signs this preseason of leaning on Maclin heavily in the passing game. Critics will point to the fact that no Kansas City wide receiver caught a touchdown pass last season. Optimists will say Maclin so far outclasses Dwayne Bowe and Donnie Avery that the touchdown stat is irrelevant. Maclin will get all the work he can handle and should even make a spirited bid for a second straight 10-touchdown season.